Today, I have an unusual and very special Would You Read It to present. Our 2 dogs were both rescued from shelters, and I have friends who have rescued horses, so the subject of this book is very close to my heart. I can't bear to see animals mistreated. So when I received a Would You Read It inquiry from Koren Helbig, an Australian freelance journalist living in Spain, asking if we could do a slightly different kind of Would You Read It I was more than happy to contribute in any small way I could. Koren told me she'd been volunteering at a horse rescue center run by Sue and Rod Weeding. (Koren blogged about it HERE.) Sue has written a picture book about a little horse who had come to them in desperate need of help. Through the book, Sue wants to raise awareness of animal welfare. All funds from the sale of the book go to two foundations: Easy Horse Care Rescue Centre Foundation (in Spain) and Kids And Ponies - Molly's Foundation (in America). But though the book is up on Amazon, it's not selling as well as they'd hoped, which they feel is in part due to the blurb that accompanies it. Koren and Sue wondered if they could share the blurb on Would You Read It in hopes that you all might be able to help. So first, I'd like to share with you a little Q&A with the author, Sue Weeding, conducted by Koren Helbig, so you get a chance to see where she's coming from and what she's hoping to accomplish. Afterwards, the book blurb will be presented as today's Would You Read It in hopes that all of you may be able to help Sue come up with a stronger way of presenting her book to the world and hopefully increasing sales (which will help fund the rescue organizations) and awareness. Three people who make suggestions for improvement to Sue's blurb will be randomly selected to receive a prize. One will receive a hard copy (as opposed to Kindle) of the book: Diary Of A Heroic Horse: Molly Gives Faith Hope. One will receive a DVD of "The Story So Far". And one will receive a signed photograph of Faith. Koren: How did you get involved in horse rescue in Spain? Sue: About 13 years ago my husband Rod and I decided that we were fed up working seven days a week. We’d both always wanted to live in the sun and Spain seemed like a nice place to go so we moved here. After about six years I started an English tack shop, which opened me up to a wide range of people and I started to hear horrific stories about how horses were kept. One day we were asked to deliver some rubber matting to a stable yard. There was Lucerio stuck in a filthy dirty stable, his eye was rotten and there were maggots in it, the flies were driving him crazy and he was hurling himself against the bars. His owner had abandoned him. They used to throw food through the bars and no one used to muck out his stall. He was two and half years old and had never seen the light of day. I looked at Rod and we both knew that our lives would never be the same again. We had to do something. After that the phone never stopped ringing. Koren: How many horses are you caring for now? Sue: We now have 62 horses, ponies and donkeys living here with us at the centre. We also have a mule, nine dogs, nine cats, two parrots, a very old cockatiel, peacocks, chicken, geese, Ernie the turkey and Isadora the pig. Animals just turn up and we never turn anyone away. We’re not an eccentric couple of lunatics that are collecting all these animals. People come to us and I feel it is only right and fair to help these animals when nobody else would. Koren: What was it about this particular story, about Faith, that made you want to write a book? Sue: I’m not a literate person. I left school when I was 14. But these animals have the most amazing stories to share and I felt compelled to write their stories from their own point of view, how they felt, their feelings and frights. Faith was the first because her story was so special. And now we’re having it translated into Spanish! There are situations out there that we as humans find difficult to address and when we come upon it – whether it’s us having an amputation or a parent or a grandchild – we don’t know how to deal with it. Sometimes handling other people’s perception of that is actually harder then going through it. So maybe my little book can help people out there who are dealing with this. It’s showing a message that it’s okay to be different. When I look at Faith I see a little pony that is surrounded by love and care, she lives in fantastic facilities, she has state of the art treatment. I do not see a sad little pony that has had her leg cut off and is in pain. That’s an important message. I also wanted to write the book in a very simple way for children because I firmly believe that children are the future and if we can educate children we can move things on for animal welfare. 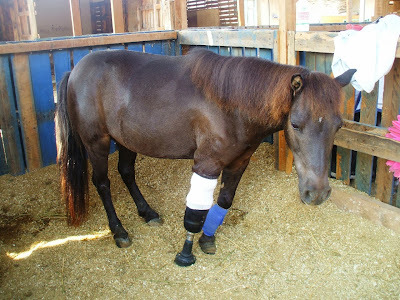 Koren: Why did you include Molly, the American pony with a prosthetic leg, in Faith’s story? Sue: I went to visit Molly in America and I got to know Kaye Harris as a friend. I know they really struggle financially, they live hand to mouth. There’s a book about Molly the pony but Kay doesn’t get any money from the ongoing sales. So I rewrote my book to include Molly’s story and half of the profits go to her, that’s my little way of helping. Koren: What do you hope your horse rescue foundation will achieve in Spain? Sue: There is a huge problem here with lack of care and lack of knowledge. The reality here is that most horses are stabled 24 hours a day in filthy, handmade conditions without proper bedding or airflow and a lot of them are not fed properly but nobody sees them so they don’t exist to the general public. Our role is raising awareness about the problem, pushing for changes to animal welfare laws and educating people, because education is the only way to stop this happening. I want our foundation to keep growing and to create other centres across Spain. I hope that when Rod and I are too old to keep going it will continue to be run by switched on young people who will carry on. I want the centre to be here forever. love and kindness and good care can accomplish. The Easy Horse Care Rescue Centre has a website HERE where you can learn more about the wonderful and important work they do and how much they are helping, but please use discretion in viewing it with children - although there is lots of joy and success, there are some terrible stories about where the animals came from and potentially upsetting photographs from "before". So now, here is the information about the book and the blurb that accompanies it. Blurb: See the world through Faith’s eyes. A beautiful picture book diary of the little amputee pony, Faith and her best friend Molly the pony. Two very special little horses who overcame all the odds to survive. One horse in America, one in Spain. Both of them rescued by people as determined as they were, to fight for life and never give up. Faith a victim of ignorance and cruelty in Spain, and Molly a victim of hurricane Katrina in America. Saving these two special little horses brought two families together across the Atlantic to form a lasting friendship and a bond between horses that can never be broken. This book has been written with love to help the horses in both America and Spain. All funds raised from the sale of this book will be shared equally between the two charities – Easy Horse Care Rescue Centre Foundation (in Spain) and Kids and Ponies - Molly's Foundation (in America). So what do you think? Would You Read It? Sue and Koren and I would all be extremely grateful for your help in coming up with a better blurb for the book. How can Sue improve it? Please let us know in the comments. Thank you all in advance for your help, and remember, 3 of you will be lucky winners! :) Anyone who would like to support Sue's efforts by tweeting or FB posting this post, Koren's post, the Easy Horse Care Rescue Centre's website, and/or the Amazon link for the book, and/or by purchasing a copy of the book, will be earning good Karma! :) You can also like their FB page HERE. And if you buy the book and like it, and would like to post a review on Amazon or GoodReads etc. that would be lovely! Love the work that you are doing and wish you success with your project. I agree with Karen. Start with a "big" movie-poster tagline. Reaching across an ocean, two ponies/horses ...I can't write more because even after reading the interview, I'm not quite sure how the horses became best friends if they are separated by an ocean. I'm not sure I would say the book was written with love. As nice as that is, I want books well-written, and that line made me think it might be less professional. IMO, the love should be part of the story, not the writing. If you want to mention that it's a diary, perhaps you can tell us whose diary it is? I wondered if it was "made-up" entries by the pony herself or if the keeper kept an actual diary. Honestly, the photo would sell the book so if there is any way to get that out there, I'd put that front and center! I tweeted the link to @blogpaws. Because I wrote for the Chicken Soup for dog lovers and cat lovers books we follow each other. Perhaps there are other animal welfare related organizations you can tweet your request for advice to? of their books will benefit their special charities, Easy Horse Care Rescue Centre Foundation in Spain, and Kids and Ponies in America. First of all, there are no reviews of the book on Amazon. If you want it to be a success do any thing you possibly can to get people to buy a copy and review it. I've bought a copy and will try and read it soon (too much to do today) and leave a review myself. My second suggestion is that you contact anyone who has a blog that has anything to do with animal rescue and ask if they will do a review of the book and post it on their blog and encourage their readers to support it with a purchase. You may have to spend some money up front on some complimentary copies. I'm not sure how that normally works on blogs, so someone else probably can give you some more advice. Get your readers to post reviews everywhere they can think of--amazon, goodreads, twitter, FB, and etc......Do you have a FB presence? Pictures of all the rescued horses and you and your helpers loving on them? If you do, do you post little snippets about daily fun things--happy things--encouraging things? It takes time, but eventually you'll get a following, and that following will help lead to sales. This amazing, Cathy! Love, love, love it. Thanks for putting such time and effort into this for us. It gives us an excellent start (if not a push to very near the finish line!) as we keep moving this along. Thanks again! Just to clarify, yes, it is a diary "written" by Faith herself, with entries from her perspective as a pony. Good tip on the photo - we do need to do more to capitalise on that. Thanks again, Wendy. Hey Tracie, yup the centre does have a FB page with quite a strong following (you can check it out here: https://www.facebook.com/pages/Easy-Horse-Care-Rescue-Centre/151489774624?fref=ts). Good tip on putting the call out for reviews, that's certainly something we need. And thanks SO MUCH for buying the book and offering to review it! We'll be super grateful if you do get time to go ahead and write a review. 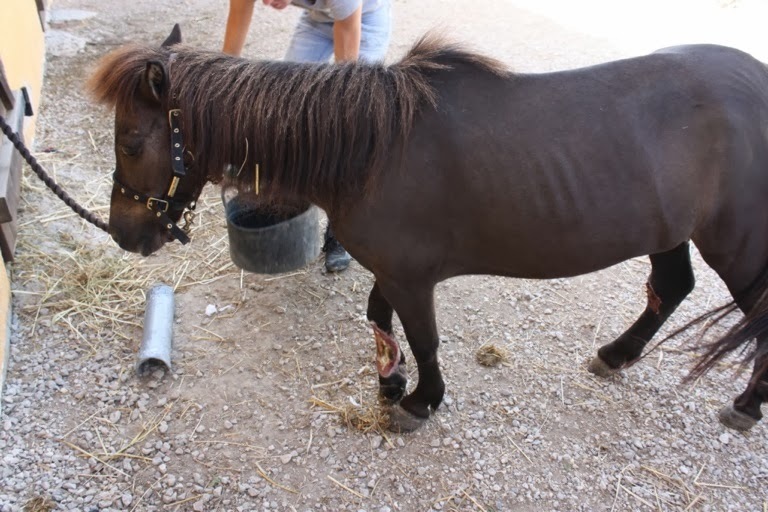 Two very special little horses are rescued in this heroic story of overcoming the odds to survive. Faith is a victim of ignorance and cruelty in Spain and Molly is a victim of Hurricane Katrina in America. Saving these two special little horses brought two families together across the Atlantic to form a lasting friendship and a bond between horses that can never be broken. What a great idea, I wish you all the best with your special book and fabulous work. Thank you so much for taking to time to craft this wonderful suggestion, Catherine! Very helpful! And I couldn't agree more about how great the work is that they are doing! all the wonderful work you are doing! Thank you so much for your very helpful thoughts, Wendy! These things really do take a village sometimes, to get different perspectives and such - it's so easy to miss things when you know what you meant to say, or when you have more background than the reader does! Thank you so much for your very helpful suggestions, Joanna! All such great ideas! Great idea, Wendy, thank you!!! I don't mind at all, Cathy! It's what we were hoping for :) Thank you so much for taking the time to do such a thoughtful rewrite! I must say, at first I was just outraged that someone would generalize this as 'a huge problem with lack of care and lack of general knowledge' and then go on to say such horrible things about the conditions in Spanish stables. I thought to myself, that can't be true! Spanish horses and breeders are well-known around the world. This couldn't be a problem affecting 'most horses' as the author claimed. Then I did a little research online and found a Foxnews article describing an economic crisis in Spain leading to the slaughter of many of Spain's legendary horses. I'm sure this isn't affecting the larger, wealthier stables, but it does seem to be a problem for the small businessman. It hurts me to see people in a situation where they have to choose between feeding their families and feeding their animals. It's not a choice they make easily. My heart goes out to them! Such a good point, Tracie! Another GREAT idea, Tracie - thank you! Koren - I've edited the post to include liking the FB page and posting reviews. I'm embarrassed I didn't think of it myself first! I know, it's so sad, isn't it Juliana? Which is why the rescue organizations need funding - to help take care of animals who have no alternatives. What a touching story. Here's my humble attempt. Katrina. 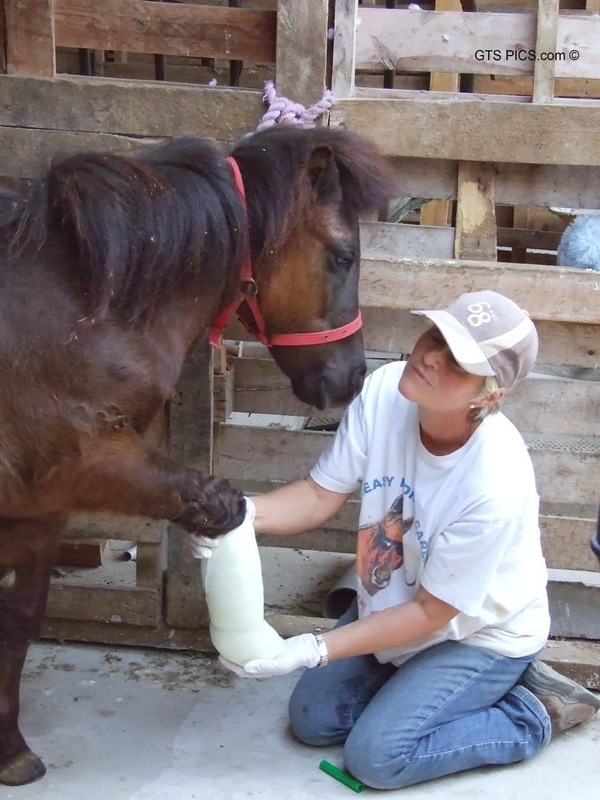 Rescuers, as determined as the horses, enabled Faith to receive a prosthetic leg and Molly to (insert something here.) The bond between these special horses and their humans is one that can never be broken. All profits from this book support horses through two charities: Easy Horse Care Rescue Centre Foundation in Spain and Kids and Ponies - Molly's Foundation in America. This picture book is full of beautiful photographs. This is a very touching story. Thank you Koren, Sue, and Rod. I can't believe that people treat animals with such cruelty. It makes me so sad to think there are many out there suffering. But...it makes me smile to think of the good you are doing at your rescue center. I think Catherine has a great suggestion for tightening the pitch to make it clearer and more appealing. Saving two special ponys brought two families together across the Atlantic: Faith, an amputee and victim of ignorance and cruelty in Spain, and her best friend Molly, a victim of hurricane Katrina. Both rescued by people as determined as they were to overcome all odds. 100% of the funds raised from the sale of this picture book diary will be shared equally between charities in Spain and America. What a great, noble project. It sounds like you got lots of great advice to get things rolling. Like others before me already said, Catherine did a beautiful job tweaking the pitch. I'd go with it. Thanks, Sue, for all the work for animals you do. I used to ride (and clean stables), and can’t believe people could treat animals like that. I like Catherine’s suggestion—it’s both touching and matter of fact, great for a non-fiction PB. My suggestion aims to give another option by incorporating Faith’s point-of-view, which is a bit more like a fiction PB blurb. Faith—a real-life, rescued pony from Spain—never thought she would find a home, much less a best friend. But after she meets Molly, another rescued pony, they strike up a friendship that saves them both. Thanks for considering "Diary of a Heroic Horse." All proceeds from this book go to..., to benefit horses like Faith and Molly. What a touching story. I love the interview, Susanna. Thank you. These are special people doing important work. God bless you, Sue and Rod! Wow! Blurb-wise, I'd definitely start with, "Molly was a victim of Hurricane Katrina...." and go from there. I would try to read it. I know things like this happen in the real world and it breaks my heart to hear/read about it. I'm almost in tears right now just reading the post. I like Tracie's thoughts about contacting animal rescue blogs. proceeds from the sale of this book. Thanks so much for coming over to read, Pam, and for casting your vote for Catherine's version so we know what appeals to you. I hope we can all help enough to make a difference for Sue, Rod, Koren, and the animals they care for! Thank you so much, Stacy! I actually like your version quite a lot because the story is written from Faith's POV so I think this would suit it. I know Sue, Rod and Koren will all appreciate your help! Thanks so much for your thoughts on the blurb, Genevieve! And as for the interview, we have Koren to thank for that.. I'm grateful to her for doing it so everyone could understand some background. And P.S. Yes they are VERY special people! I know - it's so awful what some animals (and people) have to go through, and I'm so grateful for people like Sue, Rod, and Koren who do so much to alleviate suffering! Thanks for your suggestions about fund raisers and raffles - good ideas! Thanks! It's a great cause. No matter how much I've seen first hand when it comes to animal cruelty I will never read something like this and not be affected.! The laws need to progress at a much faster pace. Until animals are given more protection, under the law, this kind of horrible stuff will continue! Here's what I wrote. Yes, animal rescue organizations websites and why not go big - a tv show or news show. Ellen Loves animals - maybe her show. A true story about two very brave ponies, Faith and Molly. One a victim of animal cruelty and the other a victim of hurricane Katrina,they both overcame the odds and survived due to the determination of two families living on separate sides of the ocean. Written with love, find out how Faith and Molly’s very difficult journey ends up forming a lasting friendship between strangers and a bond that will never be broken. All funds raised from the sale of this book will be shared equally between two charities – Easy Horse Care Rescue Centre Foundation (in Spain) and Kids and Ponies - Molly's Foundation (in America). Cathy, Catherine and Stacy C have done awesome pitch fixes for this, I think. Combining a little from each of their suggestions, I am sure a winning blurb can be formulated. It definitely would benefit from tightening and I loved Stacy C's Molly POV. Congratulations to Koren Helbig and Sue Weeding for all that they are doing and for raising awareness for these wonderful creatures who have no voice themselves. I wish you much success with the book and with your worthy efforts. This is lovely Catherine - thanks for taking the time to put it together. Thanks for your well wishes and excellent suggestions, Vivian! Ooo, Kim - we LOVE the Ellen idea. Thanks for helping us to think big! How awful, Keila. I hope you and your loved ones were safe and sound. Huge thanks for your input with our new and improved blurb! How nice that you were referred over, Kate. We'll definitely take your thoughts on board, too. Lots of thought-provoking suggestions coming through! Good job, Martha. Thanks for adding your excellently crafted words to the mix. I know exactly what you mean, Kathy. Sue still breaks down in tears almost every time she talks about the various rescues. But it's so lovely that so many of these horses now have a peaceful place to live out their lives - and Sue and Rod are really doing a lot of work on prevention and education so hopefully one day this will all be a thing of the past. That's an excellent suggestion, thanks. And thanks for spreading the word! Ooo, this is really good, Stacy. Something totally different and really aimed at children. I like it - thanks so much! This is great, thanks Lauri. I especially love the "best friends living an ocean apart" line. Thanks so much for taking the time to craft this. Everyone has done a wonderful job, haven't they? We are so lucky to have such terrific helpful people around here! And thanks, Vivian, for your ideas about marketing - another new thing to try! Thank you, Sue, Rod and Koren for your important work! And thank you, Susanna for posting this! The pitch has good things to say. It just needs to be shortened and focused a bit. I think Catherine Johnson's rewrite is excellent. And people sure are coming up with great marketing ideas! I wish you the best of luck! 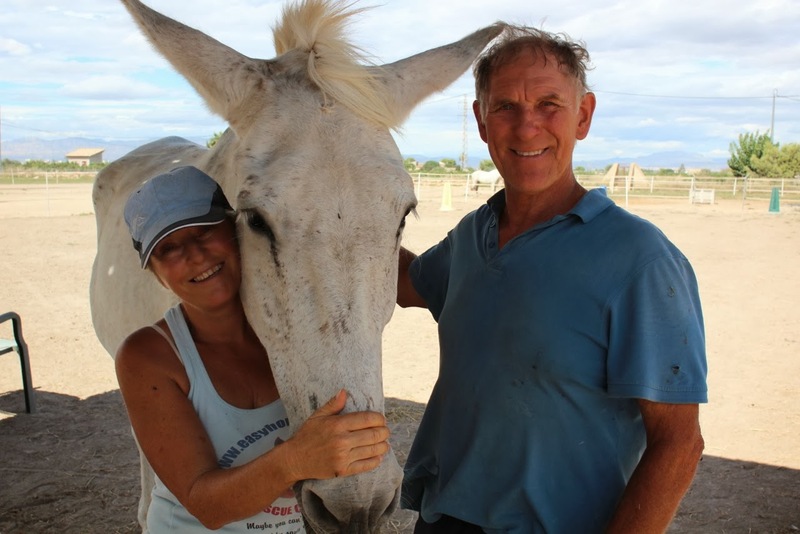 I hate when animals suffer, so I'm always so glad and grateful to hear of people like Sue and Rod and Koren who are willing to go out of their way to help! Thanks for your expert input on the pitch. Catherine's does seem to be a popular one! Susanna, Yes it IS Heartbreaking! And very difficult in many ways to be involved in such heartbreak on a daily basis (it's why I personally had to distance myself for a while with what I was doing in this area). There is great and lasting Reward in such work though and I give thanks every day for people like Sue, Rod and Koren! You are welcome! Ellen has a very big audience and one of those celebrities that does a lot to help animals (as well as people). It's also obvious, to me, the motivation comes from her heart. Thanks, Koren! And thanks to you, Sue and Rod for taking care of animals like Faith and Molly! What a good interview! I LOVE the idea of this book. I haven't seen a horse rescue book before (there is a horse rescue where we used to live called "The Last Chance Ranch". My family supported it. Very cool topic for a book. I would shorten the pitch a bit. I was wondering about the age range 6-13. Is it more of a picture book or story book/non-fiction? And YOU, Susanna, who rescues pets and posts blogs like these to help spread awareness! A big thank you to all of you for your time and the great comments and ideas you have given us to help promote Faith`s book. A drop in the bucket, but hopefully with enough drops we'll make a difference! Hi Sue and Rod - Thank YOU for all that you do. I know I speak for all of us when I say we are happy to do whatever little bit we can, spreading the word, buying the book, to try to support your efforts. I wish I'd known about this video before I put the post up - I know people would have loved it. I'm going to tweet the link and post it on my FB page in hopes people will see it. Ok, now that I've read the book and written an amazon review, I'll get a little more picky here since I don't know a better place to get picky. First--I'm not sure the title is that relevant to the book. Molly is really just a mention, and it's stretching even the anthropomorphic nature of the book to think that her story helped Faith herself. Now--helped the humans figure out how to help her, that I'd buy. I like the scrapbook look to the book. I don't like the glare on the photos. I think the writing could be tightened up quite a bit, which would help it's read-aloud appeal. If you are thinking of editing this some time in the future let me know, and I would be happy to oblige with some suggestions and grammar error stuff. I'm not a professional, but I read a lot and can see a couple ways to make this a better book and fix a few grammar mistakes. HOWEVER--it's a nice little book as it is, and it's for a good cause, and I think when I read it to my granddaughters they won't care about much of the above. I hope you find ways to get it out there and that your project continues to be successful. This is a nice blurb, except for me it doesn't have a lot to do with the book. If this book was about Molly and Faith equally, or about a friendship forged across the oceans by the people in the story, maybe. But this book is 95 percent about Faith. Molly is only a really a mention in this book. In fact, it is one of the sections I'd rewrite if I were doing it myself, which I'm not. And that is not meant as a slam to the writer of the story. I think we all see things we would write differently or tweak if given the opportunity. I agree, Tracie. I've read the book also and it really is about Faith. I think Sue kind of added the Molly part in because she met them and liked them, and Molly is the only other pony this has ever happened to, and to justify giving part of the funds to the American organization. Good on your friends! Poor Chance, thank goodness she's been given a second chance now! Hey Tracie, I've just read your Amazon review and it's lovely, thanks so much for taking the time to do that and support us. We'll certainly have a think about the other bits and bobs you've mentioned, too. Yup, you're spot on there, Susanna. Keen to hear what others think on whether real littlies would be okay with the content, though. Yes, and thanks to you other animals are having second chances too! Thanks so much for your excellent and helpful thoughts, Nancy! I know Koren, Sue and Rod will be appreciative!